Research has revealed more than 100 African Americans, free and enslaved, who lived in Waterbury in the eighteenth and early nineteenth centuries. The details of the lives of Waterbury's African Americans, and Native Americans, uncovered through probate records, lawsuits, census data, church records and published histories of Waterbury, have been pulled together here as short biographies. As new research is completed, these biographies will be updated and new ones added. The Westbury section of Waterbury, which became Watertown in 1785, had a relatively large population of African Americans. Other sections of Waterbury, including Farmingbury (now Wolcott) and Northbury (now Thomaston), had very few African Americans and are included in the Waterbury list. In addition to the names on these lists, there were numerous people who appear in census records and church records but were not referred to by name. 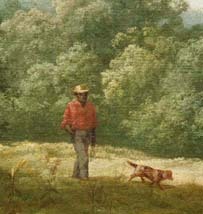 Painting of a farm in Watertown, with an African American man walking in the distance. Collection of the Mattatuck Museum.